A Go-Jek motorcycle taxi driver and a passenger travel along a road in Jakarta, Indonesia, on Saturday, Aug. 4, 2018. 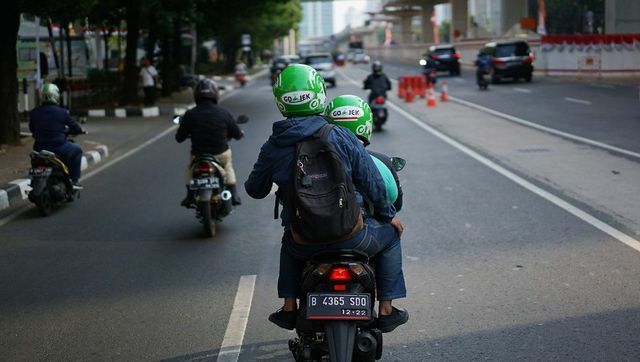 Photographer: Dimas Ardian/Bloomberg Ka Kay Lum March 7, 2019 Indonesia-focused private equity firm and early GOJEK backer Northstar Group has completed a partial exit from its investment in the ride-hailing unicorn. An industry source who is familiar with the development told DEALSTREETASIA that the PE firm has divested about one-fourth, or 25 per cent, of its stake in the startup to generate high multiple returns for its LPs. “Northstar has already returned the fund, so its remaining stake in GOJEK is now a bonus. Also, there is no pressure from LPs now [to exit],” said an industry executive aware of the developments, who spoke to DEALSTREETASIA on the condition of anonymity. Northstar first invested in GOJEK from its 2014-vintage fourth fund, Northstar Equity Partners IV. The fund was closed at around $810 million in 2015. Its LPs included Singapore’s sovereign wealth fund GIC, Maryland State Retirement and Pension System, New York State Common Retirement Fund, University of Texas Investment Management Co. (UTIMCO), and Spice Private Equity. According to a UTIMCO disclosure seen by DEALSTREETASIA, Northstar Equity Partners IV had generated an internal rate of return (IRR) of 14.9 per cent as of November 2018. In comparison, Northstar’s second and third funds, both also backed by UTIMCO, recorded an IRR of 2.48 per cent and 0.13 per cent respectively. However, the IRR for the fund may work out to be closer to 30 per cent since the LP information is a little dated and has not taken into account another significant exit, this industry executive added. Northstar declined to comment in response to an email query on the partial exit and returns on its fourth fund. Northstar invested in GOJEK in 2015, the same year that it held the final close of its fourth vehicle at $810 million. Before that, it was its early-stage venture capital arm NSI Ventures — now an independent entity and known as Openspace Ventures — that had invested in the ride-hailing firm in 2014. In 2016, former Northstar executive director Andre Soelistyo joined GOJEK as its president, and currently holds 3,357 shares in the startup. He was previously a commissioner at Kartuku, which was bought by GOJEK in 2017 from Northstar. Nadiem Makarim, the ride-hailing unicorn’s co-founder, was also the chief innovation officer at Kartuku before joining GOJEK full time in 2014. This week, GOJEK announced securing another $100 million from Indonesian conglomerate Astra International for the first close of its ongoing Series F round. The company has now raised over $1 billion from investors including Google, JD.com, Tencent Holdings, Mitsubishi Corp. and Provident Capital. In April 2018, DEALSTREETASIA had reported that the PE firm was preparing to raise its fifth vehicle which will target to raise a little over $800 million, about the same size as its fourth fund. Based in Singapore, Northstar manages more than $2 billion in committed equity capital dedicated to investing in growth companies in Indonesia with a secondary focus on other Southeast Asian markets. The firm was founded by former Goldman Sachs banker Patrick Walujo and former PricewaterhouseCoopers executive Glenn Sugita in 2003. It started investing in 2006, counting US private equity major TPG Capital as a shareholder. Its other LPs include global sovereign wealth funds, pension funds, endowments, family offices, and other institutional investors. Including GOJEK, Northstar has invested in more than 30 companies across the banking, insurance, consumer/retail, manufacturing, coal and mining services, technology, telecom, and agribusiness sectors. Last November, it invested $50 million in Vietnam-based education startup Topica Edtech’s Series D round. Some of its notable investments include a $103-million management-led buyout of Singapore’s largest property broker ERA Singapore and the $238-million acquisition of Singapore-listed precision machine parts maker Innovalues Ltd.